The first thing that stands out regarding Sturges’ films is the constant theme of role reversal. His protagonists either begin poor before winding up wealthy through some happy accident, or they begin wealthy and wind up in the lower class. This gave Sturges the perfect vehicle to make social statements throughout his catalogue. And it wasn’t always related to wealth. Politics and sexuality both took a cheerful beating from Sturges as well. In many cases, it almost seems to be a case of Sturges poking fun at some of the more obvious hokey, cheerful films made by his peers. The situations are farcical, surely done for spoof. There are many layers to Sturges’ comedy. Amazingly, it works on a self-referential, almost meta level. His masterstroke, Sullivan’s Travels satirizes a film director’s attempt to understand his audience. And in that regard, his films have a personal flair to them, constantly referring back to his own life. Sturges himself began his life as a member of a wealthy family, only to descend into poverty via multiple failed inventions, before finding his stride as a screenwriter and director. Those characters you see on the screen during a Sturges film are Sturges himself, bit by bit. His comedy also included what was his hallmark–snappy, rapid-fire dialogue that didn’t pander to the era. In fact, it seems fresh still today, not at all a relic of the 1940s. There’s a subtle vein of cynicism buried in his comedy and it pushes the quality so much higher. Sturges typically worked with a troupe that included Joel McCrea, William Demarest, Arthur Hoyt, Franklin Pangborn, Al Bridge, and Raymond Walburn. It’s important to note the tremendous scope of influence that Sturges has had. Woody Allen and Robert Zemeckis both drew inspiration from Sturges, and the Coen brothers have made a career out of nods to him. In fact, one of my favorite parts of watching Sturges’ films has been catching specific plot points and characters that the Coens have borrowed. There’s a reason the American Film Institute has it on the top 100, as well as #39 on the 100 Years, 100 Laughs list. It’s pitch-perfect satire of Hollywood while also carrying a tremendous social statement about the poor and impoverished of all races. It’s certainly not a bad film by any stretch. Coen fans will delight in seeing the character who served as the template for Maude Lebowski. That said, it lacks much of the sizzle of other Sturges films. Billy Wilder was a writer. He started as a screenwriter. And a huge number of his protagonists, as such, were writers. His films all possess the soul of a writer, and I don’t say that in any sort of trite or cliché way. As you’d expect from a writer-turned-director, his stories are phenomenally sound, structurally. The screenplays are as tight as can be, some of the best ever written. And his writing background gave him a panache for giving characters just the right lines in highly quotable ways. Of course, the writer protags were just a gateway to grander stories. Where Wilder excels that Sturges did not is in versatility. Sturges’ films may have been deep and multi-layered comedies, but they were comedies with a hint of drama. Wilder did both drama and comedy, often at the same time, and to great effect. In fact, his impact on the film noir genre is undeniable, with major weight going to Double Indemnity and Sunset Blvd. 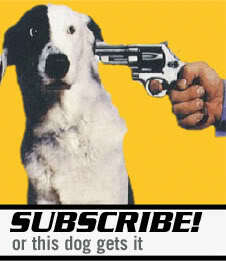 I'm ready for a shitload of appreciation, Mr. DeMille. Like Sturges, Wilder didn’t pander to his era. He took on taboo topics like prostitution and alcoholism without batting an eyelash, a risk that could have cost him if his films hadn’t been so brilliant. Also like Sturges–and more so than Sturges–Wilder’s humor was delivered with a heavy dose of cynicism, a relic of his outsider’s perspective of American cinema (Wilder was Austro-Hungarian, and didn’t move to the U.S. until 1934). And yet, that cynicism could be delivered many ways. Sometimes, it was humorous (Sunset Blvd.). Other times, it was sweet (Some Like it Hot; The Apartment). Still others, it was ruthlessly heartbreaking (The Lost Weekend). Wilder didn’t have a troupe, per se, but William Holden and Marilyn Monroe both enjoyed tremendous success working with Wilder that they did not with other directors. Jack Lemmon was as close to a troupe as it got for Wilder. The pair worked together seven times. With all due respect to many of his other phenomenal movies, Sunset Blvd. is Wilder’s true masterpiece. It’s perfect in nearly every way, including the pitch black humor; the gory insider’s view provided of Hollywood; the performance turned in by Gloria Swanson and, to a lesser degree, William Holden; the cinematography, which magically transforms bright sunny Hollywood, California into a gothic wasteland of broken dreams; the nods to Hollywood history and the way film industry folks are chewed up and spit out. It’s fascinating, and is as uniquely an American film as you will ever find. This effort from 1953 felt a little bit out of place as a Wilder film. The drama and the comedy didn’t blend nearly as well as they do in other Wilder films, and the comedy felt more forced and slapstick-y than Wilder’s typical humor. This is an almost impossible task, primarily because these two directors are remarkably similar once you peel back a few layers. Both started as screenwriters before becoming directors. Both cast a cynical, satirical eye towards American society. 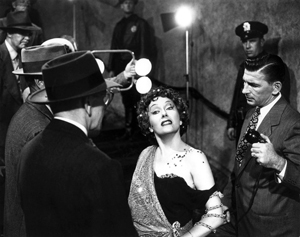 Both can lay claim to legendary masterpieces which took on the Hollywood machine rather directly (Sunset Blvd. ; Sullivan’s Travels). Both of them created timeless films, especially comedy, by breaking the saccharine sweet boundaries established by their peers. And because of their insistence on bucking the system, both of their films seem much more fresh today than films created by their peers. Making this even more difficult is that I’ve developed a bit of a bias towards Sturges. I love them both tremendously but Sturges resonates with me a little more. That bias takes some of the objectivity away. Having said that, I suppose there has to be a tie-breaker. And in the case of these two, the obvious tie-breaker for me is that Wilder created three true goliaths of cinema–The Apartment, Some Like it Hot, and Sunset Blvd.–while Sturges can only claim Sullivan’s Travels in that same category. To be sure, many of his other movies were extremely good. They just can’t quite match the intensity of Wilder’s trio. And so, the victory goes to Wilder by the slimmest of margins. Yay, Billy! I was hoping he’d come out on top. I’ve seen five out of the nine films of his you’ve listed. Can’t say I’ve ever heard of Sturges, however, I am aware of Sullivan’s Travels. I may just have to check him out. Maybe I’ll watch The Palm Beach Story… for the obvious reason you’ve mentioned. As a Coen fan, you can’t go wrong. The film that the director is making in Sullivan’s Travels is called “O Brother, Where Art Thou”. They’re also big on the dark comedy in a lot of Sturges movies (Unfaithfully Yours comes to mind). The plot of Christmas in July is right out of The Hudsucker Proxy. It’s really fun picking up on all of this stuff. “Sullivan’s Travels” is truly a great film. Sturges is very good, and I’ve only seen 4, but I don’t think they have aged as well as Wilder’s films. You’ve under-rated Stalag 17 and Double Indemnity. (possibly my all-time favorite film!) The motivations of the characters in DI are so subtle and interesting, it’s a perfect film. You need to see ‘The Miracle of Morgan’s Creek’ and ‘Witness For The Prosecution’, both are classics. Definitely have both of those in queue, and can’t wait to see them. I think you forget about Wilder’s mentor Ernst Lubitsch, a director who would win over those two all by himself! For Sturges, I love The Lady Eve and I personally love it more than Sullivan’s Travels! But for Wilder, Sunset Blvd. is the film, for a long time it was in my Top 10 of all time. Even if I love Double Indemnity I still think that SB is a masterpiece! Sunset is one of my all-time favorites, probably a top 5, definitely a top 10. It’s one of the movies that really turned me on to that era of Hollywood. Yesss! Great to see another Iron Director post. I LOVE these. 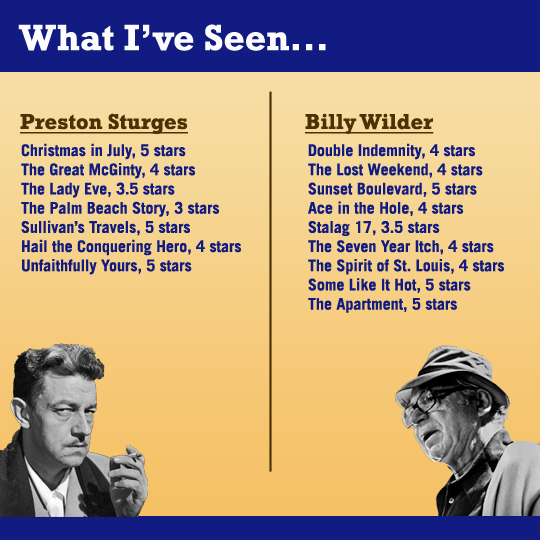 Billy Wilder and Preston Sturges was a nice matchup, although I haven’t seen any Sturges films, sadly. Nevertheless, this gave me a good idea of him and I’ll be adding some films to my ever-expanding watchlist. Great work! You’ve got good stuff ahead of you re: Sturges. I realize you haven’t seen it, but I would put ‘The Private Life of Sherlock Holmes’ lower than ‘Stalag 17,’ which has a great William Holden performance at its center. Another reason Wilder gets the edge over Sturges (whom I also love) is he wrote hits for other directors, such as ‘Ninotchka’ for the aforementioned Lubitsch, and ‘Ball of Fire’ for Howard Hawks. I’d love to see some of what he did before he came to the US. The cool thing about both of these guys is that I’ve still got a lot more films to see. I know Wilder took a bit of a hit late in his career, and I’d like to find out if the movie market tired of him or if the movies are genuinely bad. i got a great insight on billy wilder after being here !! 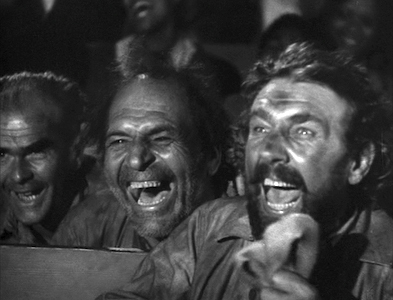 I agree that you’ve underrated Stalag 17, one of my all-time favorite movies (and one I watch near Christmas each year). I admit, however, that I’m sadly lacking in experience with regard to Sturges and also need to see more of the Wilder catalog. Nice post! The Palm Beach Story is about 100 times more funny than ANY comedy by Billy Wilder… Regarding Billy Wilder’s characters being writers…it’s true, but therein lies the problem. Wilder spent too much time thinking about writing, and not enough thinking visually. Sturges was no great visual stylist himself…but one of the worst examples of telling, rather than viewing is the scene in S.B. When William Holden describes the hands of Gloria Swanson. In a book, fine. But in a movie, even one narrated by a dead man….just inexcusable. If you can’t make the point visually….don’t even try.